Last year during one of the many online sales, I was lucky to get "Embroideries from an English Garden by Carol Andrews" at a really good price - online deals are a blessing in many ways. At first glance I loved the book!! Anyone who loves flora and fauna embroidery would love it too. The designs are realistic and the colors are eye-catching. I will not post too many clear pictures for fear of breaching copyrights - sorry!! There is a good mix of simple and not so simple designs. And for the non long and short stitch enthusiasts, it is not completely needle painting based. But yes, knowing L&S is a big advantage. There are about 25 large and small projects and the larger projects can be broken down and stitched according to preference. I have shown you just couple of pics. Read, read, read and understand. There are a lot of notes. Novice or not, the contents need to be read multiple times. 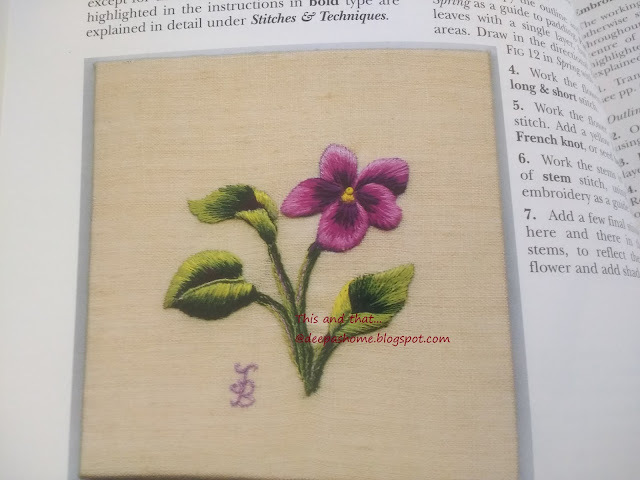 Every project has been described in detail with the thread colors and stitch methods. No complaints there. The last pages have the patterns in actual size. 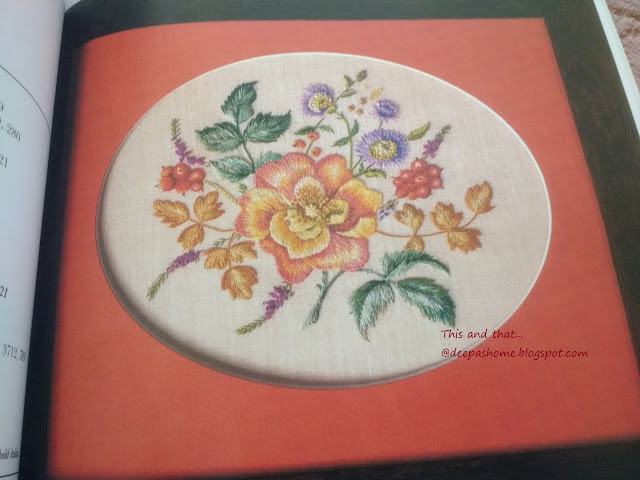 Before I decided to write this post, I started a simple sampler project in this book. 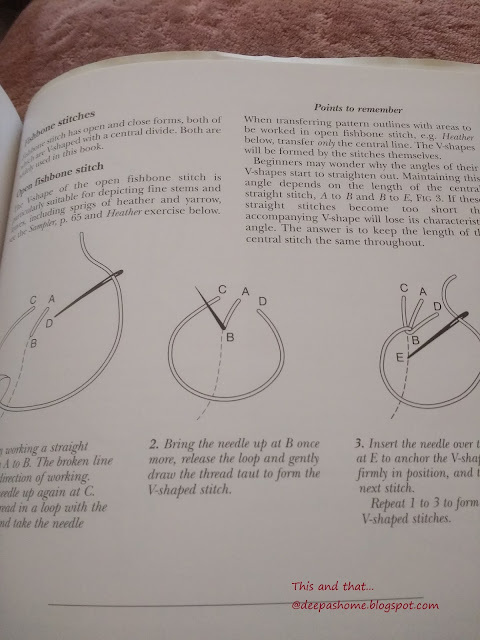 I have the patience to sit and read through materials and so the casual description of stitch stem stitch for x,y,z and couch c and d was ok. But when I came to executing one particular stitch, the stitch tutorial really stumped me. Have a look at the pictures and tell me what do you think? 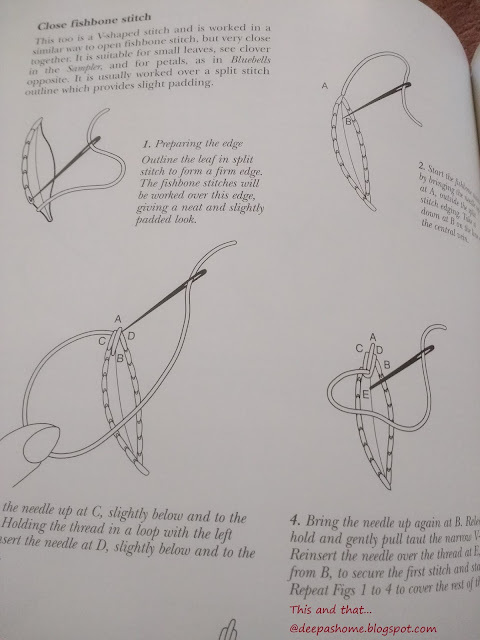 I have stitched fishbone variations all these years and these are not how they are done. Of course, I wouldn't doubt the expertise of the writer but two full pages of wrong stitch instructions??? or may be the stitch name got mixed up. 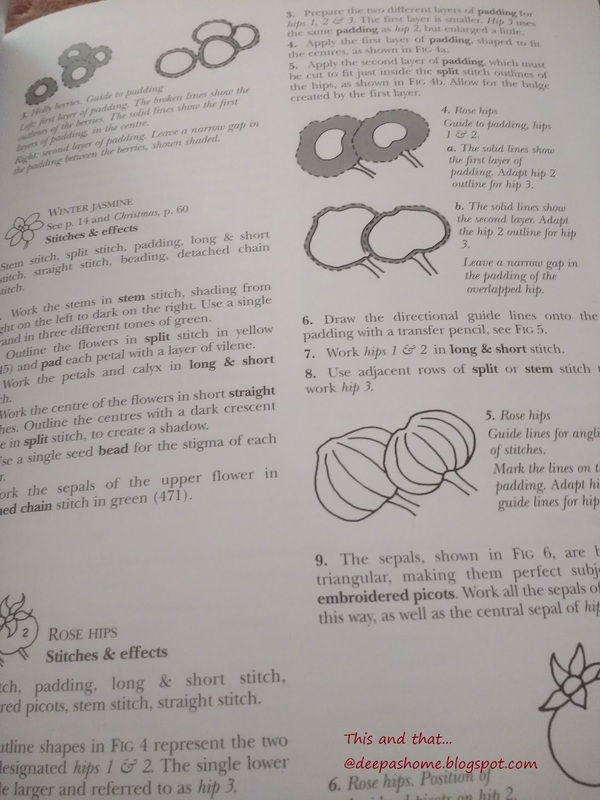 Anyway this does not change my opinion of the book - it is a wonderful resource and even if you don't stitch any of the projects, just flipping through the pages makes you feel as if in bliss!!! 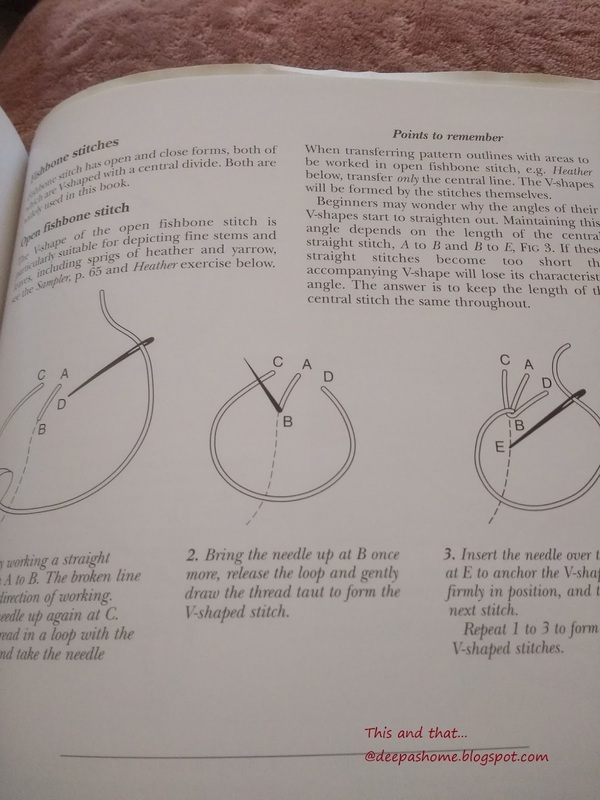 In my recollection, there are feather stitch variations which are sometimes called fishbone stitch, but there are also stitches called fishbone stitch which are composed of straight stitches. I don't think the names are entirely set in stone! That stitch looks basically like a fly stitch I think. I looked in several of my stitch dictionaries and none of them show it done quite that way...instead relying on straight stitches. Interesting! I find this book is a great inspiration, though I've not as yet actually stitched anything from it! I love the designs. The stitch does look like a fly stitch or even a chain stitch. I'd say do what you want to do that works in this instance!